Henri François Brandt (1789­-1845) was born in the Swiss canton of Neuchatel. His first master was a certain M. Perret, who was a well-known watch case engraver. He was apprenticed to Perret at the age of eleven in 1800. Seven years later he went to Paris, where he was given a position as engraver at the Royal Mint by Jean-Pierre Droz, a fellow Swiss citizen who was at the time Keeper of the Mint. Interestingly, during his time in Paris, he studied with the great Neo-Classical painter Jacques-Louis David. He left Paris in 1814 and, after a brief stay in Switzerland, left for Rome, where he stayed for three years. There he had the opportunity to meet the great sculptors Canova, Thorvaldsen, and Rauch, among many others. 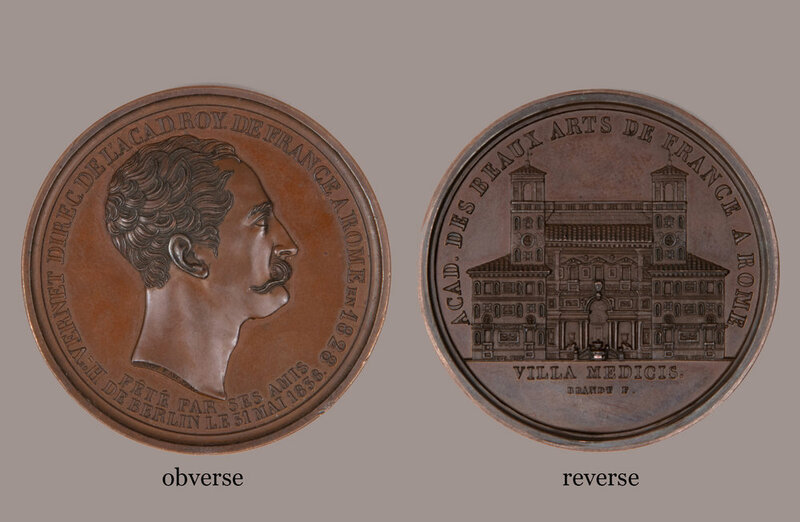 Brandt also engraved, in 1815, a medal of Guillon-Lethière, who was the current Director of the French Academy at the Villa Medici. In 1817, he was summoned to Berlin and was appointed First Engraver of Coins and Medals at the Royal Mint, a position he kept until his death in 1845. The subject of this elegantly struck and patinated medal is the French painter Horace Vernet, who was the grandson of Joseph Vernet, one of France’s foremost painters of land and seascapes, and the son of Carle, the witty chronicler of elegancies of the post-Revolutionary decades and Empire. Horace was a modernist but little affected by Romanticism, aside from his friendship with Géricault. He was openly hostile to the Bourbon Restoration, and his studio became a meeting place of artists who shared his political views. Nevertheless, he was made an officier of the Legion of Honor in 1825, a member of the Institute in 1826, and was appointed Director of the French Academy in Rome at the Villa Medici in 1829. He stayed at the Villa for seven years. The Revolution in July 1830 also provided Vernet his most important patron, Louis Phillipe, who was an early supporter and who became King of France. This medal was commissioned in 1838 by Vernet’s German friends and admirers in homage to his years at the Villa Medici.